File name with an absolute path on the file system of the server. File name with relative path to the “data” directory of the Jedox Integrator installation (default: .\tomcat\webapps\etlserver\data\files). File residing on a network drive (see instructions in article Accessing network files). Note: in general, the FileSystem location has the best performance, especially for frequent access to small files. Files from a remote server using the HTTP protocol. The URL of an HTTP request that has a result in the corresponding file format (csv, xlsx, json, or xml). If a HTTPS request is used, then the SSL certificate will be automatically imported in the keystore. See SSL Configuration for a Standalone Installation for more information. Off: SSL is not used. Trust: SSL certificate will be imported to the keystore if not yet available. Verify: SSL certificate is verified. Note: if the certificate has not been imported correctly, the following error message occurs: “Unable to find valid certification path to requested target”. The username for HTTP basic authentication. The password for HTTP basic authentication. Files on an FTP server (File Transfer Protocol). The supported protocol is FTPS (FTP with SSL/TSL) in explicit mode. The URL of an FTP request that has a result in in the corresponding file format (csv, xlsx, json, or xml). The username for the FTP request. The password for the FTP request. File on the Jedox File Manager (Report Designer). With “Browse” you can select a file in Report Designer; with “Open File Location” you can change directly in Report Designer. Option “Use SSL” has to be checked if Jedox Web uses HTTPS protocol. 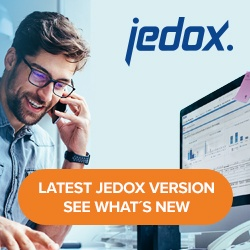 Note that you can only connect to the Report Designer that is on the same instance as the current Jedox Integrator. Files on the file-hosting service One Drive, operated by Microsoft. OneDrive for Business is an integral part of Office 365 or SharePoint Server and provides place in the cloud where you can store, share, and sync your work files. The username for access to OneDrive. The password for access to OneDrive. 1. Office 365 business account. To connect to One Drive from Jedox, you have to create an application (app) in Azure Active Directory (Azure AD). This can be done from one of these Microsoft links: https://portal.azure.com or https://apps.dev.microsoft.com. The application type must be client-native. For the access of One Drive, the required delegated permissions for the API “Microsoft Graph” have to be assigned to this app. In the registered app, the permissions have to be granted to each account – either by the individual user for his account or by an admin consent to the application for all users. For more information see https://docs.microsoft.com/en-us/azure/active-directory/active-directory-integrating-applications. Files on a server that provides WebDAV (Web Distributed Authoring and Versioning) support. The username to access the WebDAV file server. The password to access the WebDAV file server. Files on the Hadoop Distributed File System (HDFS). HDFS is a core component of Apache Hadoop, a framework for distributed storage and processing of very large data sets. Internally, it uses the WebdHDFS REST API, which is built into the default Hadoop installation of Hortonworks HDFS. HDFS URL: The address of the namenode server of the HDFS. It starts with the protocol prefix “hdfs://” followed by the hostname and the port. Host Name of the host. you can add “IP address sandbox-hdp.hortonworks.com” to the file hosts. The location supports the Hadoop distribution of Hortonworks Data Platform (HDP) in version HDP 2.5.
http://hortonworks.com/hdp/. If you are interested in other distributions or other versions, please contact Jedox Support. Note: by default, HDFS runs in non-secure mode, in which no actual authentication is required. Secure mode, in which each user and service has to be authenticated by Kerberos, is currently not supported in the Hadoop package for Jedox Integrator.